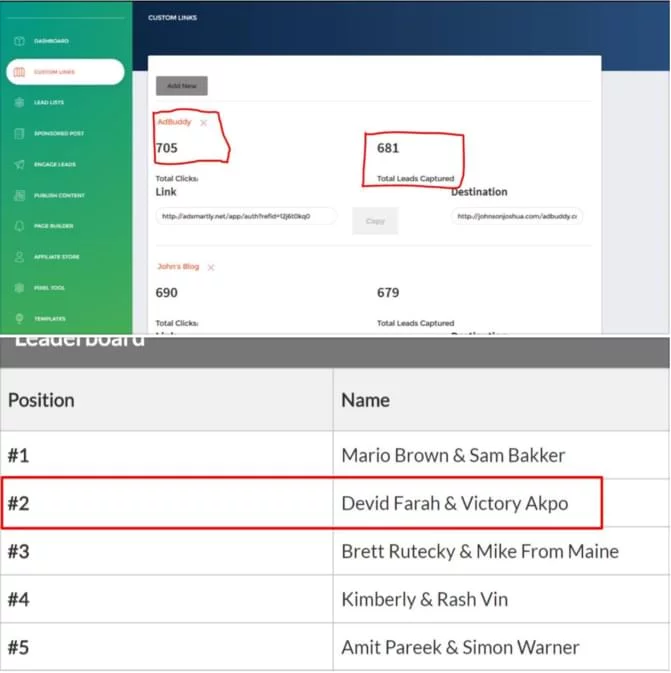 1 SOFTWARE = Explosion Of Leads From Facebook In 2018! Are You Ready To Start MAXIMIZING Your Profits From Every Facebook Post? What If There’s A Way To Turn Likes & Comments Into Leads? your sponsored posts for a second. 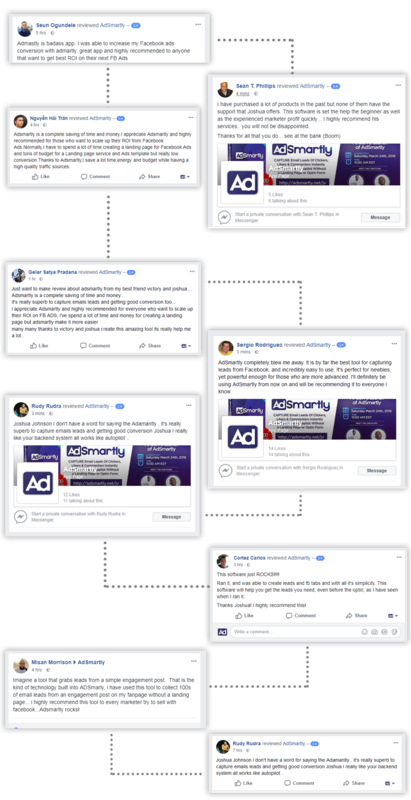 Adsmartly is a One-Click software which enables you to capture the emails addresses of all clickers, likers and commenters on your Facebook ads and sponsored posts. You Don’t Need Any Landing Page Or Opt- In Forms. 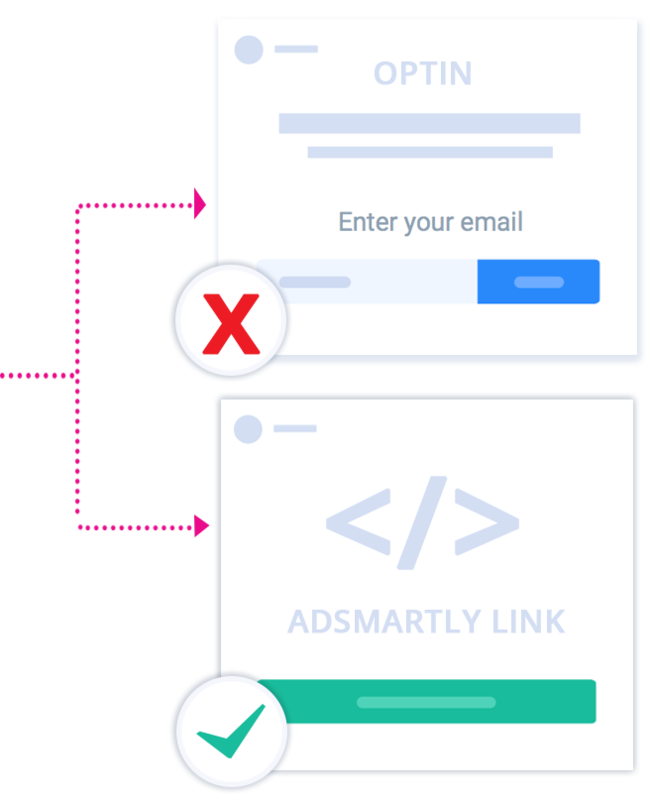 You Just Need The Customized Adsmartly Link. You can then export these leads as a warm audience you can remarket to later on...WITHOUT paying Facebook a penny more on advertising. [+] Publish Content/Instant Share functionality - Instantly publish your created content across Facebook and Twitter..
[+] Editable Templates – millions of images you can quickly use to create Facebook specified ad posts. It's time to Get your customers back & increase sales with Messenger automation. Do you Have a wordpress content website or blog but still love to profit with Amazon? Then This is a great WordPress plugin which lets you easily and flexibly embed Amazon products in your posts, pages or widgets. It use the official Amazon Product Advertising API and you make money with every sale that comes about your site. Hyper VidCasterLive is Facebook Live Video streaming tool which allows you to go live in Facebook with Pre-recorded video and share across all your pages. You can go live immediately or schedule live video for future. Also this application has option to create Live Event for more Engagement before actual live broadcasting. Animate Your Existing Stuff or Create Elaborate New Animations. We are bringing how you add animations to your site to a new level. Meet Animatic, a frontend animation editor for WordPress. Animate your existing stuff in your website and create complex animation composed of your images. it let’s you collect data from Facebook pages, groups, event and locations. You can scrape, collect emails, telephone, urls, address, ecc in just one click. You now have the power to generate more lucrative leads from Facebook than ever before. [+] Advanced engagement technology with leads for more sales. [+] Engaging posts samples-to save you time and effort. [+]Facebook ads graphic images with Facebook media requirements implemented, so no more problems with your media being rejected by Facebook. [+] Plus- posts that can be simultaneously posted on Facebook, Twitter and Instagram-for more coverage and exposure of your brand. 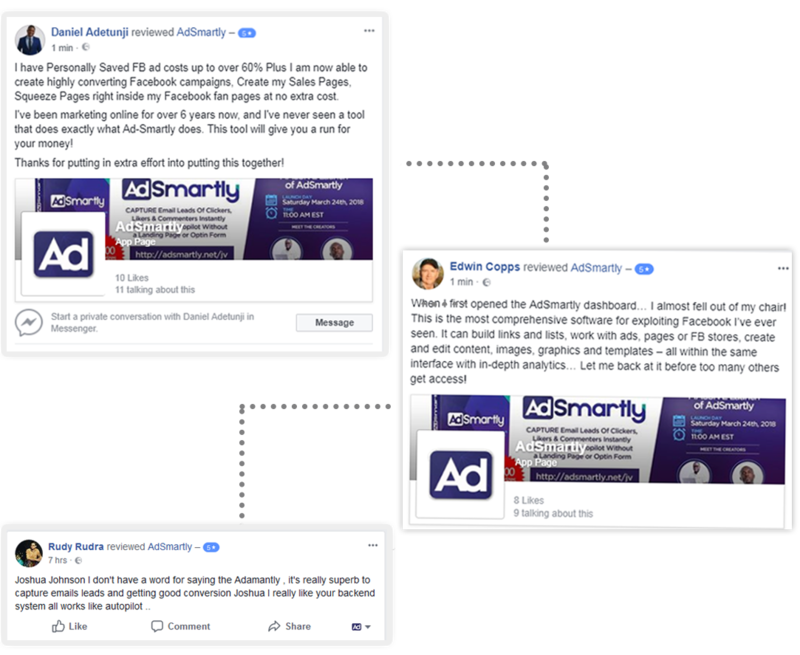 [+] Create 5 sub user accounts on our Portal...So if you have local business clients, or ecom or shopify clients...or anyone else paying for Facebook Ad’s...They are going to benefit from AdSmartly Deluxe too...and keep doing business with you. 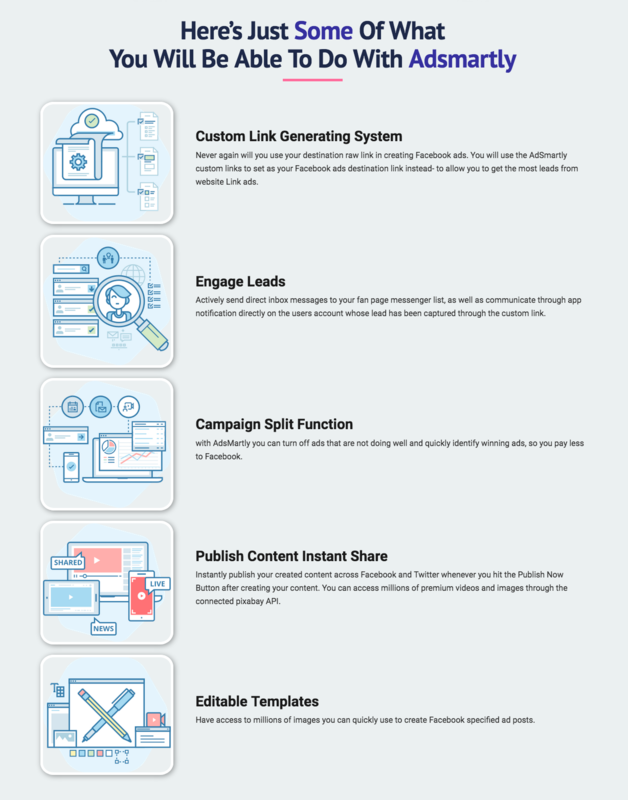 Adsmartly FB builder allows you to Leverage the power of Facebook SEO and its Viral Traffic to make even more sales and grab instant leads without your prospects having to fill in an opt-in form. 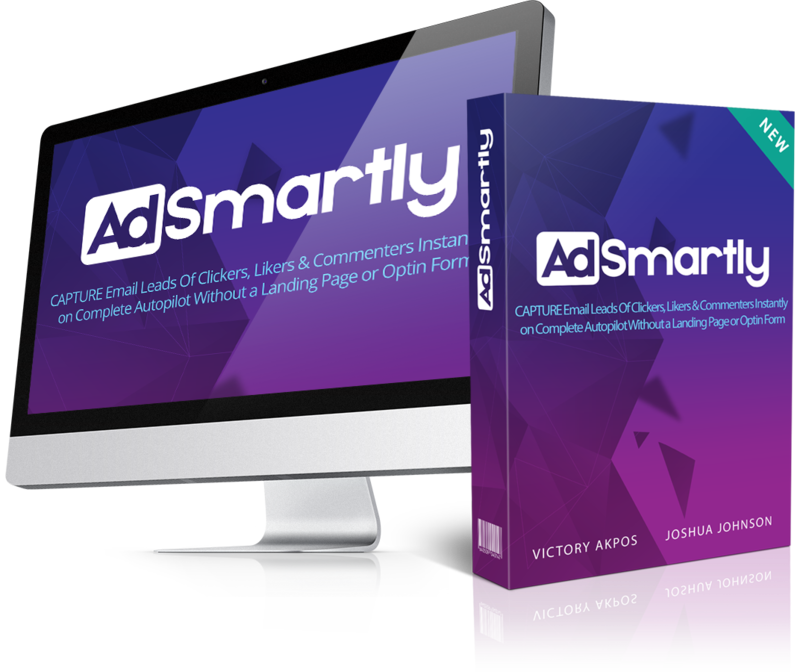 You will get access to the engage Leads function of Adsmartly to make this happen. This function means you can engage with any leads who click on your custom links or your page button. They will be sent directly to a landing page where you will capture their lead. This is the last offer I have for you. I could not let you go today with offering you the chance to make even more income with AdSmartly. You know by now how this game changing software can make a massive difference to the amount of leads and sales you make right? ...to sell it to other users for extra profit.